Fighting for reform, fighting for New York. There are a number of significant challenges that could result in an undercount of the 2020 census, particularly in states as diverse as New York. Billions of dollars for programs that provide food assistance to needy families, early childhood education to low-income children, and maintenance for the bridges and roads are tied to census data. Given whats at stake, $40 million for community based outreach represents an incredibly wise investment. We applaud and congratulate the Assembly and Senate for including this funding in their budgets and encourage the Governor to include census funding in the final budget. 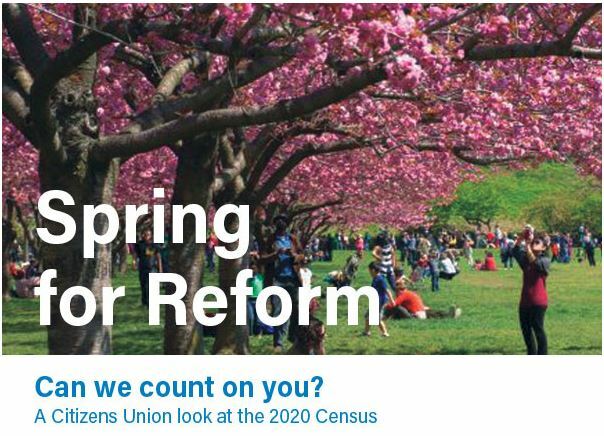 Citizens Union has announced its search for a Part-Time Coordinator to lead its new Civic Education and Engagement Project. The project’s mission is to bring together young people and education experts in a campaign to increase civic participation in voting and community involvement. The Coordinator will manage the project under the direction of the Director of Public Policy. In 2018, Citizens Union commissioned a Policy Capstone Project from a team of graduate students at New York University’s Robert F. Wagner School of Public Service. The team looked at the cost of implementing early voting and electronic pollbooks and how much the state would save by consolidating the primary elections for federal and state offices. The Report finds that implementing early voting, electronic pollbooks and a combined primary would cost NYS $49.5M over ten years, and result in ongoing savings in small and rural counties. Citizens Union calls on Governor Cuomo and the legislature to include funding for early voting in the State budget.